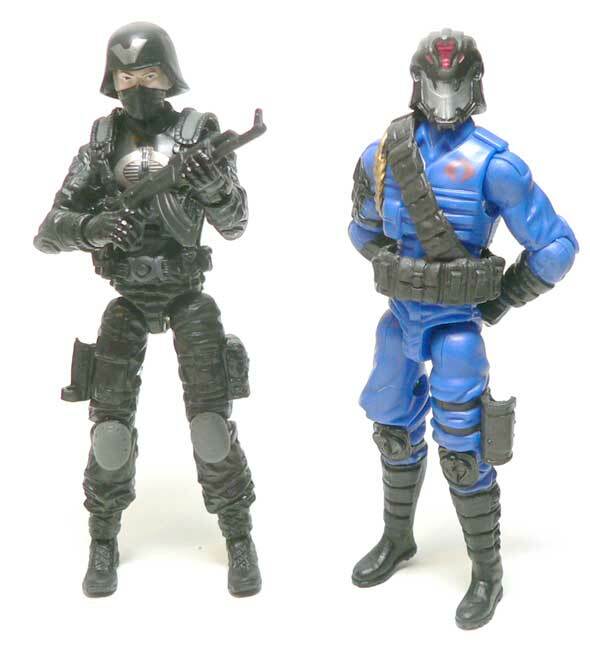 It sure seems like Cobra Commander is turning into the Darth Vader of GI Joe figures. Yet I keep buying them. Honestly, I was going to set this guy aside and try and flip him later. But it got the better of me. 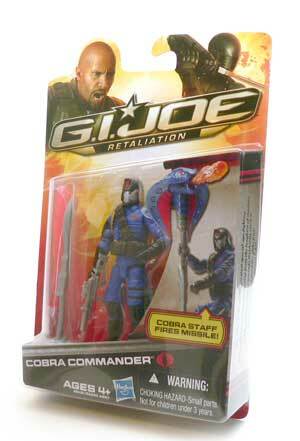 Is this a screen accurate Cobra Commander from GI Joe: Retaliation? Who knows? Since the movie is delayed, we’re not entirely sure. (Insert Fanboy Groans Here.) My guess is probably not. It is a cool update to the Commander’s look though. It has both the ceremonial look and military style we’ve come to know from CC. Honestly, it probably leans more towards the military side compared to some of the other designs. The helmet is a bit of a departure from the standard chrome face. However, stylistically, they did a great job here. 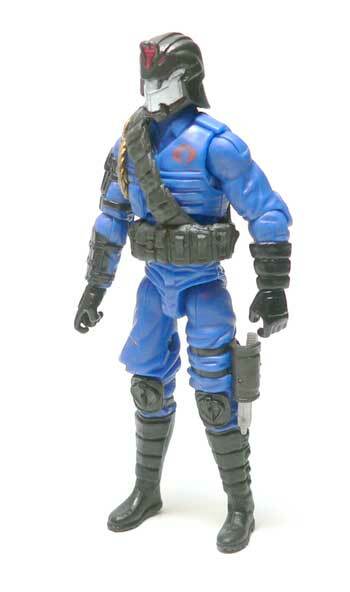 I think he’s a nice update while still being recogizable as Cobra Commander. The ornate helmet looks more Commander than it would a Viper. The cobra on the forehead reminds me a bit of an Egyptian mask. The teeth really add the bite of evil this character needs. I really like this head more as I look at it. Obviously, this is the blue version. I’ve mostly seen this one. However, I have seen one black suited CC. Personally, I think the blue one is a little nicer. The black one looks a bit plain to me, where the details stand out better with the blue. The paint is limited, but there’s no reason for a ton of it. There is small Cobra logo on his upper left chest and the black for the straps and cloves. That’s bout it. The web gear has a gold braid on it. Normally, I’m not a huge fan of metallic paints, but it works well here. Speaking of the web gear, CC’s got some major pouch action going on here. I don’t know what he’s keeping in the, but he’s got enough room. They’re all pretty well sculpted and I have no complaints. I really dig the Cobra knee pads fro some reason. They add that just over the top bit that Cobra Commander needs, but in a subtle way. There’s been crying and bad words bantered about the internet regarding the articulation on the movie line of Joe figures. Yes, it isn’t what we are used to. Is it horrible? No. The thing I miss the most is the ankles. They add a slight bit more posability to the figures over the solid ankles. I know everybody wants double jointed knees, but I’d be happy with ankles. The one place I was let down a a slight bit is his hands. Not the fact that they are missing joints, but the way they are assembled. The right one really isn’t very secure. The peg keeps pulling out the wrist when I put stuff in it. The spring loaded gadgets that toy companies feel compelled to include normally hold little interest for me. This time however, they sucked me in. 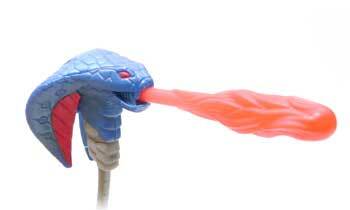 CC comes with a staff with a large Cobra Head on it. Push back and it shoots a fire ball. On top of the staff, CC comes with two weapons. The first is a small pistol that fits in his holster. Oddly, the holster is on his left leg, but the right hand is sculpted with a trigger finger. The second weapon is a generic looking rifle. Maybe I’ve been spoiled by all the Marauder items I’ve been looking at lately, but both of these guns look a little thing to me. I was prepared to be disappointed. Yet, I found myself really enjoying this figure. Sure he was missing ankles and a display stand. I really wont miss those. Honestly, it’s Cobra Commander. 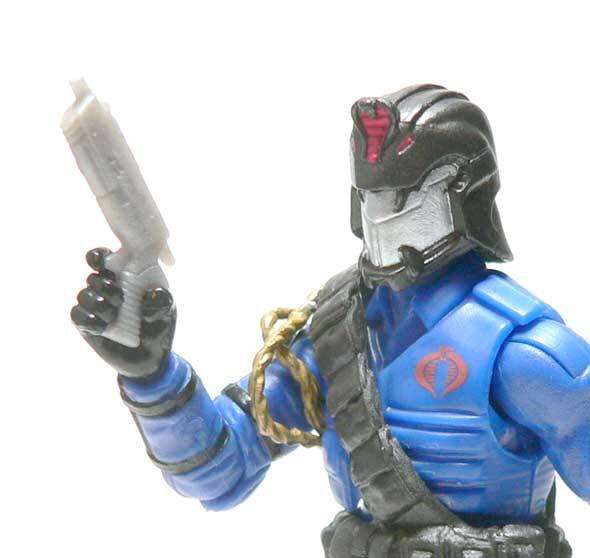 Well, it’s a new look for Cobra Commander. The helmet and mask just look a little tougher to me than the old chrome face. I have to say the more I have this figure in front of me, the more I like it. Looks nice, but I don’t know if I’ll be as forgiving about the missing ankle joints on G.I. Joe figures. I mean, being better articulated than their contemporaries was one of their strong selling points, after all. He really grew on me the more I handled him. He’s still on my desk, which is the sign of a good figure typically. I really can’t find much to like other then the head, maybe the knee pads? Just not blowing me away, I have seen him on the pegs a few times and passed him up.